I think we are on to something exciting here. Our new book is a movie book, a new concept entirely, one which takes book illustration to the next level. 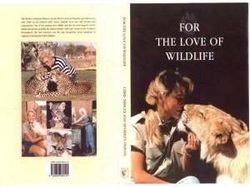 Sprinkled throughout the book are the URLs for sixty YouTube video clips of Kalahari wildlife. 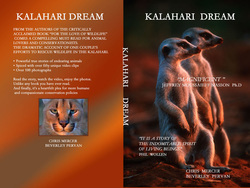 As you read about the animals, you will be able to click on the URL and see them as they were. You do not merely read about Snooky the catatonic jackal who had been kept in a small cage all his life, and continued after release in to a large 6 acre piece of natural bush, to pace back and forth in his imaginary cage. You watch him on video. So we are presenting something that is unprecedented, designed to use all the latest technology, especially tablets, ipads and the new colour Kindle which is due out soon. Reading a movie book with e-readers will be a seamless experience. "Their honest account rings clear across the plains..."
This is the true story of one farming family’s efforts to rescue wild animals in the harsh wilds of Namibia. An uplifting saga of extraordinary rescues, of success and failure, of triumph and tragedy, this book will make you laugh and cry in equal measure. You will learn a great deal about African wildlife. Also how to establish a wildlife rehab centre – and not what to do. How rough and ready African solutions can surprisingly succeed even in the most unlikely situations. As the book reviewer wrote in BBC Wildlife Magazine : Here is the real thing – warts and all. Where does the money go? Not on fancy wheels or holidays; the boodle goes to the Campaign Against Canned Hunting. Click the button below.